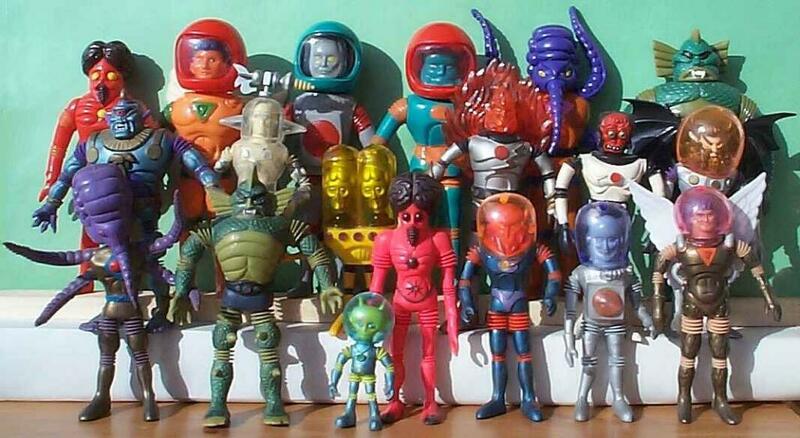 of the best Outer Space Men collectibles ever made. The toys pictured here come from many different collections. The intent of this site is to attempt to catalog all the different types of vintage OSM toys as well as the myriad knock offs, most of which were by companies from the orient. If you have something as a part of your collection that is not pictured, PLEASE send me a photo. I can credit it any way you want (with your name, a pseudonymor just anonymous). In a few cases I will even pay money for pictures as will be seen as you surf this site. However I am not particularly looking to post Fourhorseman pics yet, as I intend to do that after the entire set is released. LINK TO OSM FLIKR PAGE post your own pics here! This site is dedicated to my friend and one of my heroes, Mel Birnkrant, sole creator and genius behind the original 1st and 2nd series OSM lines. The Outer Space Men and all the alien names and likenesses used on this site are trademark and copyright Mel Birnkrant and Gary Schaeffer. Many thanks to both of them for their help and advice on building this web site.